The University of Alabama strongly encourages students to get involved in research throughout their undergraduate degree. Research significantly enhances a student’s understanding of the scientific process and is a critical component of a student’s qualifications for graduate programs, especially in the fields of physics and astronomy. 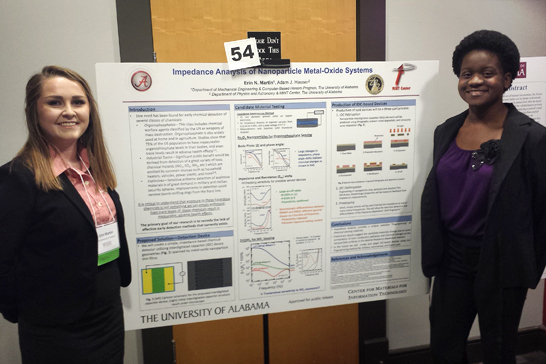 Interdisciplinary student engineers Erin Martin (left) and Tobi Adedokun (right) present a poster at the 2016 UA Women in Science and Engineering (WiSE) Symposium. Pathways to Science is a project of the Institute for Broadening Participation (IBP). It supports pathways to the STEM fields: science, technology, engineering, and mathematics. Pathways to Science places particular emphasis on connecting women and minority groups with STEM programs, funding, mentoring, and resources. Its website can be used to find undergraduate summer research opportunities and graduate fellowships. The Department of Physics and Astronomy provides many opportunities for juniors and seniors majoring in physics, or related fields, to be involved in active research on cutting edge scientific topics. This page lists faculty currently seeking undergraduates to be involved in research and examples of projects students are currently or have recently been involved in. The following faculty members are currently accepting undergraduate students for research projects: Jeremy Bailin, Jerry Busenitz, Conor Henderson, Adam Hauser, Matthias Kaminski, Gary Mankey, Preethi Nair, Igor Ostrovskiy, Andreas Piepke, Ion Stancu, Dean Townsley. If you are a student looking to get into research and something sounds interesting to you, please email the faculty member and make an appointment to discuss research with them. You are also encouraged to contact other faculty members not on the list above to inquire about projects during the semester or the summer. Micromagnetic investigations of spatial fluctuations of the first order perpendicular anisotropy. X-ray properties of merging galaxies. Structural decomposition of elliptical galaxies in the HST COSMOS and Frontier field. Impedance analysis of zirconium-based chemical sensor materials. Theoretical investigation of damping in exchange bias systems. X-ray Magnetic Circular Dichroism (XMCD) of metal-oxide nanoparticles. Thermal Spin Transfer Torque in Confined Systems. Materials Design for Spintronic Devices. Raman Spectroscopy of carbon coalescence induced modes. Automation of a Near-Field tip production apparatus. Setting up a Magnetostriction apparatus: a instrumentation point of view. Development of a radon detector. Development and installation of a data acquisition system for the cosmic ray veto detector of the EXO double beta decay experiment.